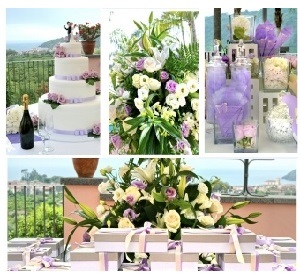 Ideally, your wedding colors and themes will come together harmoniously without much effort. There are endless options, but how do you settle on one idea that reflects your personality and the unique love that you share with your future husband? Some couples automatically have ideas based on details of their relationship, such as throwing a Valentine’s Day wedding if your first date was on that holiday. Once you have a basic theme or holiday which relates to your big day, you can select colors that appeal to your personality as and lifestyle. Any element of your personality can influence your choice of wedding themes. Once you get that theme, you can start thinking of related colors which blend well together. Alternatively, you can do this in reverse by starting with colors that you feel reflect the mood you want to set at your wedding. Those colors may remind you of a particular season or item which leads you to a wedding theme. Most wedding colors and themes are not as simple as a “beach theme” or a “winter wedding theme.” You will find many wedding favors and decorations advertised with those general terms, but your wedding may incorporate a blend of unique theme elements that together reflect your personality, that of your future spouse or key details of your lives and relationship. For example, you may know that you want to have a beach wedding, but you aren’t limited to beach wedding favors and decorations. You can say that your theme is a combination of sin city and the beach, since you met in Las Vegas. Your wedding colors may incorporate white and blues in reflection of the water, but you may enjoy gambling games on the sand during the reception. Your favors may reflect the beach, summertime or various elements of gambling and Las Vegas. You can create a dream or vision board to explore different options for your wedding theme and color scheme. Take a large poster board, cork board or other type of display board and attach items that help you come up with elements of your theme or see color combinations together. 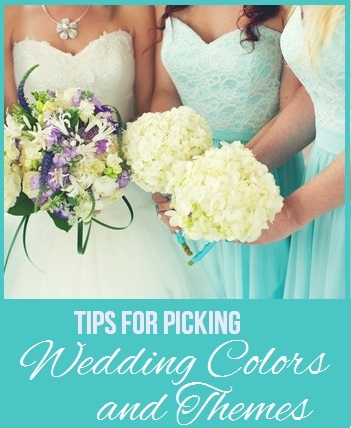 You may go to the paint section of a local hardware store and use the color swatches for the paint to get the colors that you want to use in the wedding. Place those colors together on your board until you find the perfect shades that reflect your personality and mood. You can then add pictures and various other items that represent elements of your desired theme or decorative features you would like to include. Once you have your vision board completed, pull out dominate items or concepts to create your unique theme. For example, if you have pictures of wildflowers with many natural colors like white, cream, pastel pink and vibrant purple, you may realize that you would like your wedding venue to be outdoors in a garden with lots of floral elements to your theme. Wedding Themes and Styles: Which One Is Right For You?